Walter Hus (1959) is a composer and pianist. Toured the international scenes in the eighties with the group Maximalist!, and created music for theatre and dance (De Keersmaeker, Vandekeybus, Needcompany…). After his Maximalist! years Hus wrote an oeuvre of operas, concertos, symphonies, string quartets, songs and piano music as well as music for theatre, dance and film (Deruddere, Greenaway, Krüger..). In recent years Hus has been exploring the computer-controlled automatic Decap organs. A “comic strip opera”. 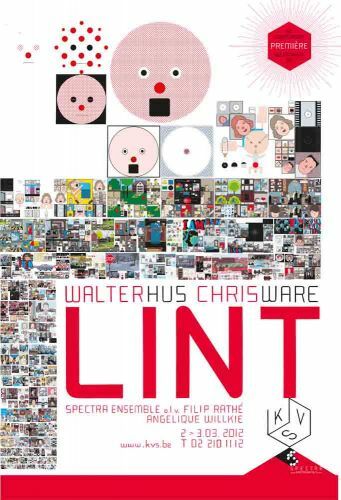 It was under such intriguing label that I watched a few months ago, a concert based on Lint, by Chris Ware, in Brussels. The spectacle is not really an opera in the traditional sense. It actually consists on a sort of soundtrack performed live – by Spectra Ensemble under Filip Rathé and singer Angélique Willkie – while the book is projected in a wide screen. The man behind such intriguing project is Belgian composer Walter Hus. After being involved in areas so distinct as dance, theatre, films and videogames, Hus decided to explore the potential connections between comics and music, something that Ware has frequently stressed in his interviews. Let’s start from the beginning. How did you decide to work with comics, and why Chris Ware? I’m not a real comics reader. I was when I was younger, but I used to read things like Tintin or Suske & Wiske. I was completely crazy for it at that time. When I grew older I’ve never accepted that comics could be considered art. At a certain point my wife became very ill and my whole life came to a standstill. A friend of mine dropped a pile of comic strips for my wife, and while I was also sitting there I looked at them myself and I got Jimmy Corrigan. I was impressed. This was beyond everything I’ve seen up to now. There were things that couldn’t absolutely be done in any other way, opening narrative possibilities that were completely new for me, possibilities of coexistence of several layers, something I was already very intrigued about. What called my attention was the use of counterpoint. In counterpoint, you have something not only linearly going from A to B but also, in the moment itself, with different lines that are independent, which is something very musical. The music of Bach, for instance, is essentially contrapuntal. It sounds beautiful as one, but you can listen to all the separate lines. You have a vertical reading and a horizontal reading, which is typically musical. Towards the centuries there were attempts to incorporate counterpoint, for example, in books containing three stories evolving at the same time, or books that can be opened in whatever point. But with Jimmy Corrigan, I found the perfect adaptation of this principle, going beyond the possibilities. And how was the project born? At a certain point I got a commission for the Spectra Ensemble and I could do whatever I wanted. I first proposed to work around Jimmy Corrigan. I have taken a portion of it, around 40 pages, and I made a sort of soundtrack, underlying the story’s psychological mood. After this first project, the Spectra Ensemble said they wanted to go on with the work. And I also wanted to go on, but Jimmy Corrigan is very long. Doing 40 pages was already too long, I couldn’t imagine doing the whole book. And also, I must admit, after a year, this guy, Jimmy Corrigan, got under my skin. He’s so depressive that I had a hard time of convincing myself to do it. At a certain point, I met Chris in New York, for an exhibition of the original drawings of Lint. I found the length of it just perfect. It’s only 66 pages, and it has this fantastic principle of one page per year. I could already imagine making 60 pieces of music, which is more conceivable, every page with its own little composition. I proposed that to the orchestra and they went along with everything. Very soon I started to abandon the principle of composing page by page and I tried to over bridge longer periods of the life of Lint, in a large breathing. But I never went synchronously. I tried to make my own counterpoint, not linked to his counterpoint. What were the biggest challenges you have faced when working with comics constraints? It’s very different to read a book and to see it projected in a big screen. Jacques Samson made a good point when he said that the spectacle transforms the reader into a spectator. Yes, it’s not the same when you’re looking at the screen or reading a book. With the book, you can look closer, you can turn it over, you can even use your magnifying glass. You can also spend as much time as you want. First, the dimension is different: the spectacle was performed in a big theater, with a huge projection. It’s immense, and you have to find your way in the scheme. And also the time, which is a very big problem, very hard to resolve. It was me who had to decide on the time the viewers have, which is very hard to find and you’re always frustrated. It’s either too slow and you’re finished already or too fast and you miss something. With Jimmy Corrigan I had a speaker reciting the text, using the same principle as when you are reading for the kids at night. And Chris absolutely loved the music and absolutely hated the voice over. He thinks the voice over is something that broke my music down. It turned my music into wallpaper. He respected the music so much that he didn’t want it to be annihilated by any other voice. This is a very intriguing point. How did you deal with the problem of duration, how did you decide much time devote to each page? This is a very hard problem. Each of these pages is like a machine. You can look at them for very long time, but you can also read fast. I think a lot of people do this: you have a first reading, then you go back and reread. Even in the day of the performance I discovered new things. Chris didn’t want to make a heavy thing out of it. He always advised me to accept the fact that you don’t understand things. I found a medium length (a minute, a minute and half per page). I was working together with a dramaturgist and we have often rehearsed the timing together. I tried to reach an average possibility of reading to give the spectator the possibility to grab something (and if you want to read completely you can always buy the book). It was very interesting to hear after the performance the reaction of the people. Each person discovered their own strategy and their own reading experience. This freedom of wandering through the pages is indeed an important part of reading comics, but that must have been tricky when combining it with music. Were you at any point tempted to guide the audience on where to look at, or to emphasize certain elements? In the beginning I started with something completely different, in a very risky business. I started to edit the pages, working together with a film editor. We showed an excerpt in Paris for an event at the Centre Pompidou, and it was very much appreciated by the public, who was taken by the hand. But Chris didn’t like it at all. He conceives his pages like that and he wants this feeling of being lost on the page and then finding your own direction. I’m very happy I finally didn’t go in that direction because, in the end, I would have been much busier with editing the film than writing my music. I finally decided to drop this idea, and I got much more freedom. I’m happy for his remark because he saved my skin. But the public is still guided by the voice over. Some dialogues are transformed into lyrics, performed by singer Angélique Willkie. Yes, what I’ve done then was to use voice. I thought it was absolutely necessary to have a human element that was like the transfer object between the public and what’s seen in the screen. In the theater context, to leave only the images and the music playing it would mean to abandon he spectator. I didn’t appreciate it. I felt the need for this person, responsible for transference. And I did this also because my music asks for it and because I discovered so beautiful lyrics inside the comics. It’s a completely different kind of lyrics than you hear in normal songs, but still very everyday language. So I’ve left pages without dialogues, pages with dialogues. I’ve adapted different principles in each page. Sometimes little phrases from the page. You stress something, but you leave the freedom for the people to read the rest. If they see that something has been already said, they can concentrate on the rest. Greice Schneider recently finished a PhD on boredom and everyday life in contemporary graphic narratives at K.U. Leuven, in Belgium. She is a founding member and a member of the editorial board of The Comics Grid. She is on the editorial board of Image [&] Narrative. Click here to read previous instalments of the Image [&] Narrative column.